Operating frequency 7.81 kHz. 8.25 kHz. Eurotek Pro Field Test By Mark Gillespie 2013. 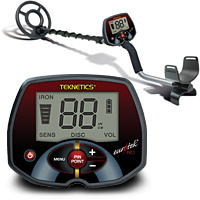 With all the metal detecting publicity on both the internet and TV it is nice to see a detector manufacturer release a machine like the Teknetics Eurotek Pro. Originally designed for the extreme hunting conditions of Europe and other areas where iron is common, it will work well as a multipurpose machine. The machine has an extremely fast re-tune speed which is necessary in the areas where iron is the most common item in the ground, and an expanded iron discrimination feature not found in a machine priced at this level. The Eurotek Pro with the 8” concentric coil sells for only $219 or with the 11” DD coil for only $299. It also has a first ever volume control feature that is not available in any other detector on the market, which I will discuss later. One of the first tasks I perform after assembly of a new detector is to check how it performs with a set of targets in air test. Over the years, I have kept a detailed record of air test results for many detectors using the same set of both ferrous and non-ferrous targets. Doing these tests gives a good indication how it might do on targets in the ground and allows me to see where each target registers on the ID number scale. This machine performed well in comparison to other more expensive machines, but surprised me by the low conductor, coil to target distances. I was expecting a low frequency of 7.8 kHz to be more sensitive to the high conductors but found the opposite to be true. At first, I thought there must be a mistake, but after an evening of testing, I knew the machine functions were deliberate. Low conductors are where gold and many European relics are. Some of the most valuable relics are in the lower conductor category. Actual air test results indicated a 5 1/2 percent increase in sensitivity (a greater coil to target air test distances on each the 8” and 11” coils) for the lower conductors, especially the lower conductors from a US nickel down. Now personally, I would rather find a gold ring instead of a silver dime or quarter any day. Moreover, with gold hovering around $1500 per ounce a couple of small rings will pay for this machine quickly. Then, it’s all profit. My next stop is the test garden where I have many coins and relics buried in depths from two to eight inches. Many of these targets are in and around iron nails and some aluminum trash. In addition to this, the test garden has been undisturbed for more than 6 years, which gives a more realistic ground test. I decided to start with the 8” concentric coil and default settings of sensitivity 7, discrimination 0 and volume 7. At these settings, the majority of targets gave a good audio response. During the next couple of hours, I adjusted the sensitivity, discrimination and volume to different levels to see how each target responded and found all coins buried up to 4” deep would give a good audio at a sensitivity setting of four. I had two targets that could not be detected even with sensitivity maxed out and they were an 8” quarter and a small copper rivet a little larger than a pencil eraser at 7” deep. However, switching over to the 11” DD coil, the quarter gave a good audio response at a sensitivity level of eight but the rivet required a setting of 10. Overall, I was pleased with the test garden results. As a final note, I would like to mention the volume control, which I really like especially in the areas where nails are common. I personally like to hear the iron but not loud so my preference for this setting is 11. At volume 11, the iron gives a very low volume, softer response that I can deal with. The following is a quick rundown of the volume feature. · Volume settings from 1-9 increase the volume for both ferrous and non-ferrous targets equally. · Volume setting of 10 and ferrous targets are silent, but non-ferrous targets are at their maximum volume level. · Volume settings from 11-20 only increase the volume of iron while leaving the non-ferrous targets at maximum volume. The Eurotek Pro is the first detector that allows independent DIGITAL adjusting of the volume levels for ferrous and non-ferrous targets. In addition, the machine also has an iron icon that will flash to alert the user of iron, regardless of where the discrimination or volume levels are set. 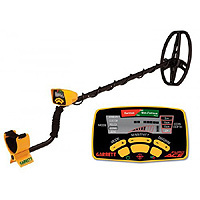 The pinpoint mode can be set to either centimeters or inches. Finally, when the user finds the settings that he or she likes, they can be saved as the default startup settings until the machine is reset. · Target ID numbers are very accurate on coin size targets, most cases I could identify coins prior to digging them up. In summary, even though the Eurotek Pro designed specifically for the conditions in Europe, it will function as a multipurpose detector too. Lacking the typical target icons to aid in target identification the machine is equipped with a target ID system that ranges from 1-99 which represents the targets electrical conductivity. Once learned these numbers can help identify many different type of coins especially the US ones. The ET Pro equipped with the 11” DD coil performs very well as a relic machine, especially old home sites where iron is so common. Very fast recovery speed combined with an expanded iron discrimination feature is essential in effectively hunting this type of site. The volume of the iron audio can be adjusted to suit the operator without increasing the discrimination level. Very well balanced, not front heavy like so many other machines in the same price range and can be used for extended hours without unnecessary fatigue. It looks like Teknetics has another winner. I've been detecting since 1981 and have had almost 30 different machines and 90 percent where the cream of the crop and I spent tons of money on them. But I found out that price doesn't mean better. Most Garrett's in the past weren't suited for me and the only thing I liked was the "Bell-Tone". But I found out that these Ace's are excellent machines that are user friendly and hit the mark set by machine that cost hundreds more ! I tried the Ace 250 as a back up for a AT-Pro and was impressed but not totally convinced. And the lousy economy has forced me to downsize my hobby. So I bought a Ace 350 and it wasn't a downsize but a real eye opening turn around ! I was digging deep and enjoying the user friendly 350 as much as my old T2 and Fisher F75 . . . maybe even more! Sure the DD coil takes some practice but with experience I like it more than a concentric. And I never liked small coils but the sniper coil is awesome for cherry picking deep coins in trashy areas most people avoid. And from user experience the Ace 350 is a notch above the 250 and hits targets the AT-Pro did in every situation I put it through land wise hands down. The weight, the depth, user friendly operation, battery life and the cost. It out preforms machines costing hundreds more . . . you can believe that ! The con's - very few, in fact almost none. I just would like to see a extra DD or even a mid-size concentric coil available.